Couches and TV trays have replaced the dining table we used to know, while technology has taken the place of conversation. Now, our dining room tables have become a place to store laundry and other miscellaneous items we do not wish to put away. It is time to reclaim our dining tables! Although purchasing a new dining set can be expensive, a good table is well worth the money. If you do not want to break the bank on a new set, flea markets are a terrific option and can be the place to find one of a kind pieces. Below are some excellent examples of dining tables you will not be able to ignore. 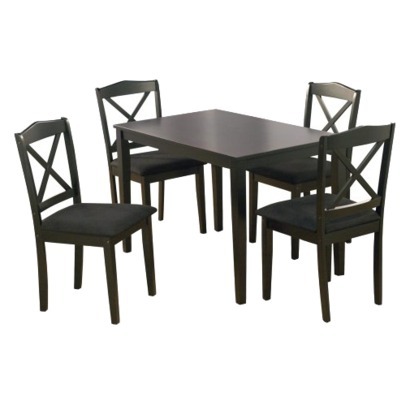 Simple, sleek and black, this table set would blend nicely in any space -- a wonderful option for those who have a more traditional style taste. Dress this table up with a bright patterned table runner/cloth. This is a bit of an investment, but will make a beautiful addition to any dining room. With its warm off-white color and hand painted details this table set is very welcoming and will easily blend into any decor with its neutral coloring. 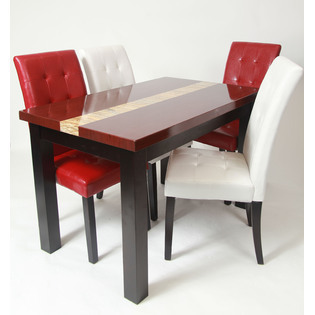 A wonderful choice for those who wish to make a statement with their furniture. This modern table set will sure to get people talking. Since the set is primarily clear it will give your room the illusion of more space, if you are tight on space. A clear vase with fresh flowers would make a lovely bold statement. Not for the faint of heart, this bright and bold table set screams "look at me!" A fun option for those not afraid of trying something different. This set does not need any accessories to brighten it up; it does that all on its own! Not all dorm students will have the option to purchase a new table, but do not worry there are options for you! To make your dining table more appealing purchase a fun/unique table runner to add a pop of color to the otherwise boring monochromatic table. Fresh flowers are also a wonderful way to freshen up your dining room and can change to keep up with the current season. Another great idea is to buy cushions for your chairs, combining comfort and style. Table runners and chair cushions come in so many different fabric options, you will be sure to find some that blend well and suite your style. If you have a table you enjoy, then you are more likely to end up using it. There is no point letting a perfectly good piece of furniture go to waste. Once you have the table of your dreams invite friends over for a family dinner; have each person bring a homemade dish, and enjoy your new furniture with good food and friends.